The quirky, creative genius that is embodied by Jack White has been manifested again in the unique super group, The Raconteurs, since 2005. In 2008, they were invited to perform at the Montreux Jazz Festival. That historic concert was captured on film and is now made available on DVD and Blu-ray and is now made available to Raconteur fans. The 100 minute set was recorded in DTS Surround Sound, Dolby Digital 5.1 and Dolby Digital Stereo – all in crystal clear, hi-def clarity. The sixteen song set was comprised of songs from the band’s two albums, Broken Boy Soldiers and Consolers of the Lonely as well as a cover of Charley Jordan’s classic song from 1940, Keep It Clean. White and fellow band members, Brendan Benson, Patrick Keeler and Jack Lawrence have the exuberant crowd on their feet the entire time. Hold On – Hard driving alternative rock. The tune yanks the crowd up by their throats and leaves them on their feet until the end of the show – and the crowd thanking them for such treatment. The super-charged bluesy Keep It Clean looks like White and the boys were having as much fun performing that song as the crowd was having listening to it. You could almost transport that performance to the first Woodstock and it would have fit right in. Finally, the hard driving and dark The Switch and the Spur was a definite crowd pleaser and the DVD watcher will love it, too – leaving all blissfully exhausted from the experience. The band seemed to thoroughly enjoy performing together which leaves one to wonder why they don’t perform together any more than they do. 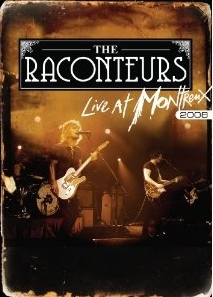 Until they decide to tour or record together again, this DVD will go a very long way in whetting the appetites of the loyal, avid Raconteur fans.